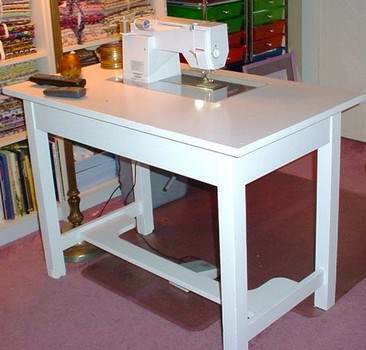 A sewing table, built just for sewing machine and supplies is a treasured piece for any seamstress. 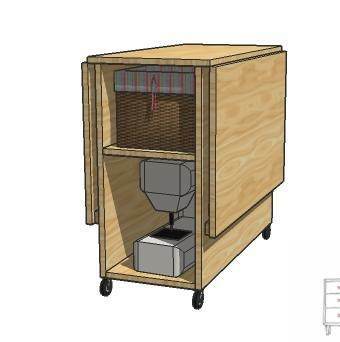 Many of these sewing cabinet plans can be customized for dimensions, including height, and all can be personalized with molding, trim and custom finish. 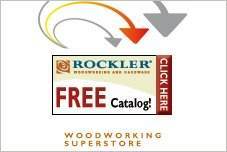 Wood can be as varied as the budget allows. 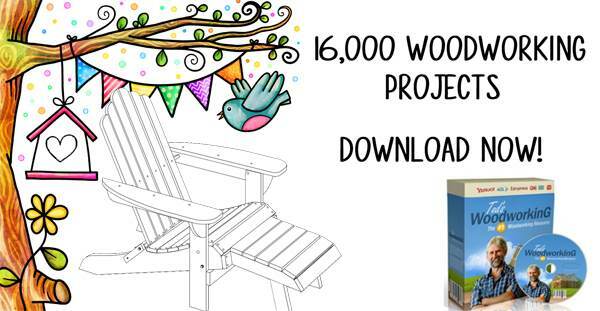 Choose from pine and walnut to oak and cherry wood. Formica is a great option for a maintenance free work surface. 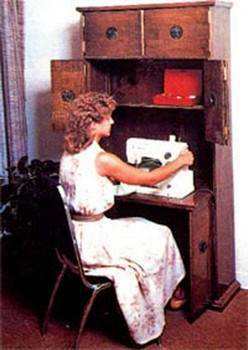 Sewing tables and cabinets are very personal, and every seamstress has different requirements for one that will suite her tastes and work habits. These cabinet and table plans have many variations, including foldout table extensions, multiple drawers, and compact versions that fit almost anywhere. Building a table just for her with free sewing cabinet plans will ensure your shirts will be mended and buttons sewn back on in record time. 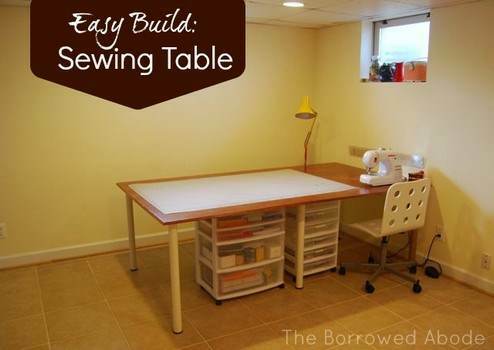 Build a sewing table with 4 drawers and a laminate top that holds a sewing machine and much more. 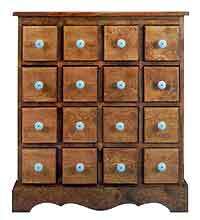 Build this apothecary chest with sixteen drawers that stands on its own and is used for storing odds and ends. More general instructions than plans, but a nice compact sewing table that opens up in many directions. 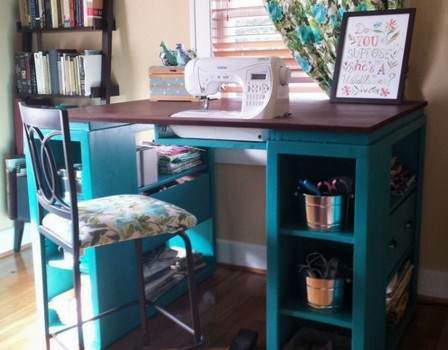 Build this awesome sewing table where the sewing machine sits flush with the table top and offers tons of storage for all your sewing notions. 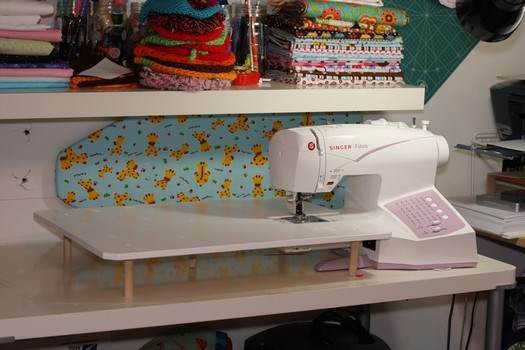 The table top on this sewing table folds down on each side to the mobile base that offers a storage area for sewing machine and sewing supplies. Sewing is made easier with this attractive sewing table designed to make the sewing machine sit flush with the table top. Build a large sewing table with lots of counter space for laying out fabric using this easy to follow woodworking plan. This plan is for a handsome sewing cabinet with a fold-out sewing table, 4 cabinets to hold fabric, plus six drawers for storing sewing supplies. 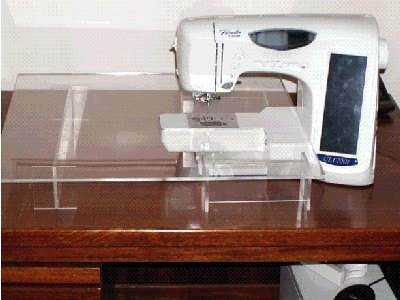 Use your woodworking tools to build this light weight acrylic sewing table that can be placed and used in most any room in the house. With just a single piece of plywood, some high-gloss white paint and a few other materials you can make this inexpensive extension table for your sewing machine.